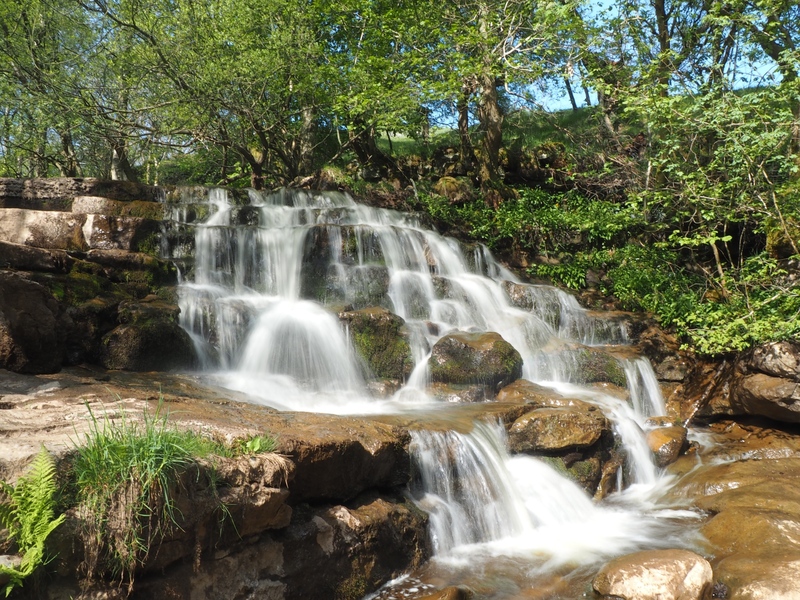 A hugely enjoyable ramble starting from Keld in upper Swaledale featuring a visit to the summit of Kisdon, stunning views and several impressive waterfalls. The main purpose of this walk was to make a long overdue visit to a number of the waterfalls that are located near Keld in upper Swaledale. As a couple of ‘add on’ bonuses the route also included a visit to the top of Kisdon as well as a visit to Ravenseat in Whitsundale. By coincidence we somehow managed to tie our arrival in Keld with a long convoy of tractors that were also arriving for some kind of rally. With the car park full of tractors we were luckily able to park at the start of Keld Lane, the track heading east out of the village. After following Keld Lane a short while we left the main track, when it dropped down to cross the Swale, to continue for a short while before making a detour to visit the first waterfall of the day – Kisdon Force. The path down to the waterfall was quite lovely with mossy stones, an abundance of wildflowers (including bluebells, violets, primroses and forget-me-nots) and the outcrops of Birk Hill Scar. The final drop down to the waterfall was however steep and slippery. After taking a look at the upper and lower waterfalls of Kisdon Force we retraced our steps up to the main path to soon leave it again on a thinner path heading for Kisdon Side. Particularly memorable on this section of the walk were the grassy flanks of Kisdon covered in primroses. Having passed the end of Rukin Wood the views really began to open out and as we traversed Kisdon Side we had cracking views of Swinner Gill and the Swale gorge. Continuing south we eventually met up with the bridleway between Muker and Keld. Turning right on this we climbed up on to the hill, leaving the grassy path at a wall for the final walk to the summit of Kisdon. The early morning cloud was really beginning to break up now and the views extended to include Great Shunner Fell, High Seat, Nine Standards Rigg and Rogan’s Seat. Rather than retracing our steps back to the top of the bridleway we instead dropped pathlessly down to the west, passed through a gate and rejoined the bridleway much further down. Continuing down the bridleway we then made a sharp turn to the left to descend into the valley of Skeb Skeugh for a short pull back up into the scattered community of Angram. The next waterfall on my hit list was Aygill Force but when it became clear that the stream bed was virtually dry I didn’t bother trying to scramble down into the deep ravine to look for the dry falls. Instead we continued over Clumpstone Hill for a crossing of Keld Side, the path eventually bringing us to High Bridge, next to the small riverside campsite at Hoggarths. My original intention had been to turn right along the road towards Wain Wath Force but, in a fit of waterfall gluttony, I’d changed my mind a few days before to include a detour up Whitsundale to visit the waterfalls beyond the farm at Ravenseat. This was my first visit to Whitsundale and I have to say it was the only disappointing aspect of the walk. Following its exposure on television the farm at Ravenseat was ridiculously busy with day trippers and the waterfalls were virtually dry. There was some consolation to be had though in the pretty unnamed waterfall on Whitsundale Beck downstream of Ravenseat. The path back from Whitsundale brought us to Low Bridge where we turned left along the road to visit Wain Wath Force, the first of four waterfalls with which we concluded the walk, the others being Currack Force, East Gill Force and Catrake Force. In between Currack Force and East Gill Force we once again came across the tractor rally which, after several hours out on the moors was returning back to Keld. To conclude what had been a wonderful day Paul treated us both to a well earned ice cream and can of pop at the Park Lodge cafe. This was a fantastic walk in one of the most beautiful parts of the Yorkshire Dales, an area that I really must make more effort to visit.